Floyd Raymond Hinshaw2,3,4,5 [Raymond Floyd Hinshaw6,7, Ray Hinshaw2,3]. 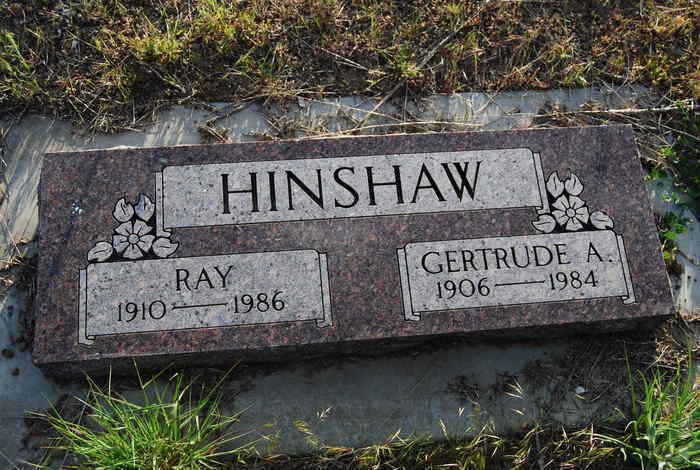 Hinshaw, Floyd R., head-of-household, age 29, born in Oregon; completed 2 years of high school; on Apr 1 1935 was living in rural Grant County, Oregon; rented home ($10/month rent); occupation: truck driver, logging; worked 45 weeks in 1939; $1000 wages in 1939. Hinshaw, Henrietta F., wife, age 22, born in Missouri; completed 4 years of high school; on Apr 1 1935 was living in rural Union County, Oregon. Floyd Raymond Hinshaw, 75, died Monday February 11, 1986, in Klamath Falls, Oregon. He is survived by his sons, Ronald Hinshaw, Eugene, Oregon; Duaine Hinshaw, Klamath Falls, Oregon; 5 grandchildren and 2 great-grandchildren. Ancestry Family Tree data "Williams Family Tree" posted by "UncleBoo49". 1920 census, Middle Precinct, Grant County, Oregon; roll T625-1494, ED 59, page 2A, line #45, dwelling #31, family #31. 1940 census, Middle Precinct, Grant County, Oregon; roll T627-3361, ED 12-21, page 7B, line #44. 1920 census, Granite, Granite Precinct, Grant County, Oregon; roll T625-1494, ED 52, page 6A, line #14, dwelling #82, family #85. 1930 census, Middle Precinct, Grant County, Oregon; roll T626-1939, ED 21, page 3B, line #65, dwelling #68, family #68. Ancestry Family Tree data "HeavenToEarthandBack" posted by "cellahide". Ancestry Family Tree data "Melinda Buker's Family Tree" posted by "Melinda Chandler". Oregon, Death Index, 1898-2008; http://www.ancestry.com.